Oh, Quesadilla Explosion Salad! How I love you! I have eaten plenty of these at Chili's and was "Oh so surprised!" to see it listed as #2 on the 10 worst restaurant salads! Number T-O-O! Too much fat, Too many calories, Too many points! It's a salad! How can it be so bad for you? Something had to be done! This is my response. I have also created recipes for the various ingredients used in this salad. They are named as they appear in the list of ingredients. Feel free to use them or your own. Beware the nutrition data of this salad will change if you use another version. A concoction I created in 2008 during the first Monday Night Football Game. 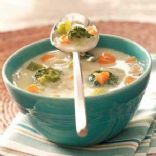 Great spring soup and ever so tasty! This salad is full of distinct, strong flavors. It's a great way to get new greens onto your plate. A filling soup that will warm you up from the inside out. Quick & easy for a busy night. Refrigerate overnight to let flavors really jazz it up!